1Department of Medicine, Pt. BD Sharma, Post Graduate Institute of Medical Sciences, Rohtak, Haryana (India)-124001. 2Department of Radiodiagnosis, Pt. BD Sharma, Post Graduate Institute of Medical Sciences, Rohtak, Haryana (India)-124001. Aortopulmonary window (APW) is a rare anomaly characterized by anomalous communi-cation between aorta and pulmonary artery with separate aortic and pulmonary origins. This accounts for approximately 0.1 % of all congenital cardiac anomalies. Clinical presen-tation is in infancy and early childhood with left to right shunt. If not corrected, large de-fects are usually fatal in early childhood. We report a 25 year old patient with Eisenmenger syndrome with large unrepaired APW, who successfully completed her first pregnancy. During early embryonic development, the aorta and pul-monary arteries separate by growth of a spiral septum dividing the common trunk into the aorta and the pulmo-nary artery. This spiral septum is created by fusion of a truncal septum growing cephalad from the semilunar valves and the aorticopulmonary spiral septum growing caudally from the pulmonary bifurcation. Incomplete de-velopment of these septae results in aortopulmonary sep-tal defect . This accounts for approximately 0.1 % of all congenital cardiac anomalies. Clinical presentation is in infancy and early childhood with left to right shunt. If not corrected, large defects are usually fatal in early child-hood. A 25 yrs old postpartum female, presented to medical emergency with cyanosis and clubbing with features sug-gestive of puerperal sepsis on 7th postpartum day, for which she was admitted and managed accordingly. Sub-sequently, patient revealed occasional episodes of cyano-sis and palpitation on exertion during last 3 years. Other-wise her pregnancy was uneventful. Clubbing was present and jugular venous pressure was raised. On cardiac auscultation heart sounds were feeble at car-diac apex and loud P2 heard on left 2nd parasternal space with prominent heart sounds in right parasternal region. No definite murmur was audible. She had no significant abdominal organomegaly. X-ray chest revealed tracheal deviation and mediastinal shift to right. Electrocardio-gram showed P pulmonale and features of right ventricu-lar hypertrophy and right axis deviation. 2D-echocardiography revealed severe pulmonary artery hy-pertension with dilated right atrium and ventricle and paradoxical motion of interventricular septum. No in-tracardiac shunt was seen. On CECT chest there was evidence of large abnormal communication between main pulmonary trunk and as-cending aorta with small sized right lung. On computed tomography (CT) angiography the aortopulmonary defect was again seen, from just above the aortic and pulmonary origin, forming a common trunk and then continuing as left main pulmonary artery and ascending aorta. The right pulmonary artery was not identified. The tricuspid aortic and pulmonary valves were normally seen. Origin of right coronary artery was normal, while the left coronary artery was seen originating about 1.5 cms higher, just at the level of shunt, shown in Figure 1 (a-d). Figure 1: a. There is separate origin of the aorta and pulmonary artery with lower parts seen separate from each other. The left coronary artery is seen arising high up from aorta. b. There is abnormal communication of the ascending aorta and pulmonary arteries with a large common channel. c. Upper extent of the lesion is seen with division into arch of aorta and left main pulmonary artery. d. Coronal reformat better displays the aortopulmonary defect, seen dividing into arch of aorta and left main pulmo-nary artery. Catheter angiography could not be performed due to pa-tients’ unwillingness. During early embryonic development, the aorta and pul-monary arteries separate by growth of a spiral septum dividing the common trunk into the aorta and the pulmo-nary artery. This spiral septum is created by fusion of a truncal septum growing cephalad from the semilunar valves and the aorticopulmonary spiral septum growing caudally from the pulmonary bifurcation. Incomplete de-velopment of these septa results in aortopulmonary septal defect. Aortopulmonary window is described as a defect in the aortopulmonary septum with separate origins of aorta and pulomonary arteries and normal semilunar valves, separating this condition from truncus arteriosus. DiGeorge syndrome, associated with truncus arteriosus is not significantly associated with APW, suggesting sepa-rate developmental origins of these morphologically very similar conditions . This accounts for approximately 0.1 % of all congenital cardiac anomalies . Of the two classifications systems proposed by Mori in 1978 , and by Richardson, in 1979 , Mori’s classification is more used and describes three types of defects. Type I, or proximal: the communication is usually rounded and lo-cated above the semilunar valves, between the ascending aorta and the pulmonary trunk. Type II, or distal: the de-fect, in a spiral curve, involves the pulmonary bifurcation at the level of the right pulmonary artery (RPA). In this type of defect, there can be hypoplasia or even interrup-tion of aortic arch due to the significant deviated flow from the aorta towards the RPA during fetal life. Type III is characterized by total absence of the aortopulmonary septum resulting from the combination of proximal and distal defects. Type I (proximal) defects occur in proximal part of aortopulmonary septum between aorta and main pulmonary artery. Type II (distal) in distal part of the aor-topulmonary septum, extending into the RPA. Type III is a combination of the type I and II. Type I defects are the commonest and type III are the rarest . About 50% of cases of APW are associated with other defects, and this makes its diagnosis more difficult. According to the literature, the most frequently associated anomalies are: aortic arch interruption (15-20%), espe-cially type A; patent ductus arteriosus (11%); ventricular septal defect (8%); right aortic arch (7%); anomalies of the coronary arteries (8%); tetralogy of fallot (5%); subaortic stenosis (3%); bicuspid aortic valve (3%) . Development of the coronary arteries also occurs during the separation of the great vessels, which explains anoma-lous position of the coronary arteries. The associated car-diovascular conditions seen in our case are hypoplastic right pulmonary artery with hypoplasia of right lung and relatively higher origin of left coronary artery. Recently echocardiography, CT angiography and mag-netic resonance imaging have also been used and found sufficient for diagnosis [7,8]. The majority of patients present in infancy with conges-tive cardiac failure. Untreated patients usually die in early childhood. Adults usually present with dyspnea on exer-tion, occasional palpitations and episodes of cyanosis with history of recurrent respiratory tract infections. Usu-ally a systolic murmur is heard with evidence of pulmo-nary artery hypertension. Our patient completed her preg-nancy uneventfully. Definitive treatment is surgical. Few patients surviving into adulthood usually have a very high pulmonary vascu-lar resistance making them inoperable. Aggarwal et al.,  have reported a few successfully operated adult cases. According to them surgical repair can still be performed in patients with Eisenmenger syndrome, if there is signifi-cant reversibility of pulmonary vascular resistance index on administration of oxygen. Love BA, Aortopulmonary Septal Defect: Differential Diagnoses & Workup. Emedicine 2009; March 16. Kutsche LM, Lodewyk HS, Mierop V., Mierop, Anat- omy and pathogenesis of Aorticopulmonary septal de- fect. American Journal of Cardiology 1987; 59: 443-447. Su-Mei AK, Ju-Le T., Large unrepaired Aortopulmon- ary Window- Survival into the Seventh Decade. Echocardiography 2007; 24: 71-73. Mori K, Ando M, Takao A, Ishikawa S, Imai Y., Distal type of aortopulmonary window. British Heart Journal 1978; 40: 681-689. Richardson JV, Doty DB, Rossi NP, Ehrenhaft JL., The spectrum of anomalies of aortopulmonary septation. J Thoracic and Cardiovascular Surgery 1979; 78: 21-27. Sridhar PG, Kalyanpur A, Suresh PV, Sharma R, Maheshwari S, Hrudayalaya N., Helical CT Evaluation of Aortopulmonary Window. 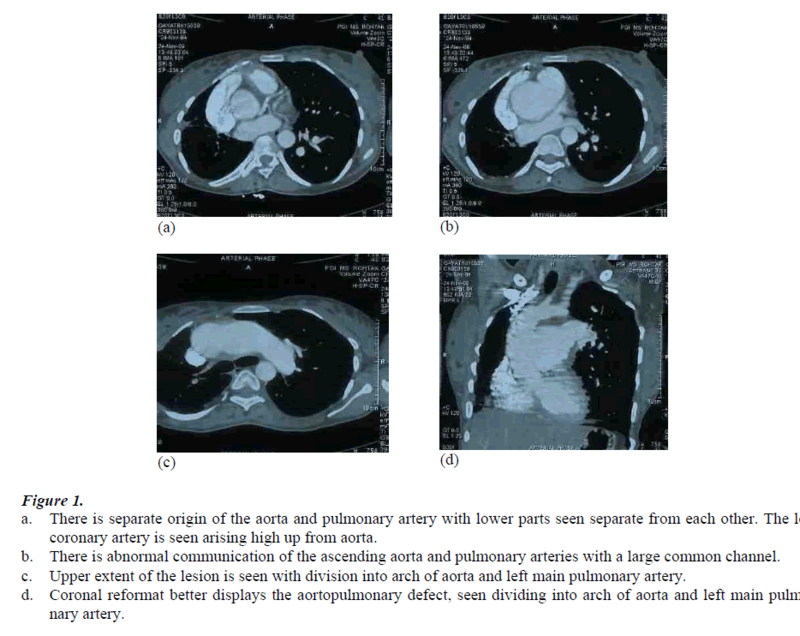 Indian Journal of Radiol- ogy and Imaging 2006; 16: 847-849. Garver KA, Hernandez RJ, Vermilion RP, Goble MM., Images in cardiovascular medicine. Correlative imag- ing of aortopulmonary window: demonstration with echocardiography, angiography, and MRI. Circulation 1997; 96: 1036-1037. Aggarwal SK., Mishra J, Sai V, Iyer VR, Panicker BK., Aortopulmonary window in adults: diagnosis and treat- ment of late-presenting patients. Congenital Heart Dis- ease 2008; 3: 341-346.